DNS architect, one of the biggest companies in the world that manufactures jet engines, turbines, healthcare machines, etc. In order for your business to thrive in a digital economy, your network must be able to connect devices and applications anytime, anywhere in the world. Those connections hinge on the effectiveness of your DNS. The reality is, as devices, applications, and DNS-based security threats multiply exponentially, the manual processes and disparate toolsets most IT organizations use to manage DNS simply can’t keep up. With Infoblox DNS, you can centrally manage and automate crucial aspects of DNS on a reliable platform, the Infoblox GridTM to deliver the high availability, efficiency, security, and application response times a truly competitive, globally connected business requires. Keep devices and applications connected at all times with 5 9s service uptime, enabled through mechanisms such as high availability, disaster recovery, and Anycast DNS. Gain agility and simplify management through automated workflows and templates. Slash operating costs by managing DNS, DHCP, and IPAM through a single, cohesive console. Deploy in any environment—physical, virtual and cloud—and scale elastically to save on upfront costs, while plugging seamlessly into newer architectures like Network Functions Virtualization (NFV). Secure your network against inherent vulnerabilities in DNS including DDoS, malware, and botnets. With Infoblox, you can prevent data exfiltration via DNS, the number one target for cyberattacks, and instantly block malicious activity at the control point for devices, whether on the premises or off. Gain continuous, actionable insight from DNS-related usage and access patterns to quickly: detect anomalies; flag suspect devices and applications; and predict threats. Improve customer experiences by accelerating the response times for your globally distributed applications. With Infoblox DNS Traffic Control, you can ensure that application traffic always routes to the most optimal servers in your network. Bolster service continuity even further by having traffic automatically routed away from unavailable servers or data centers to active ones. Reduce operational inefficiencies that can adversely affect responsiveness by using a single, integrated tool for DNS, IPAM, and global server load balancing. Improve customer experiences by accelerating the response times for your globally distributed applications. With Infoblox DNS Traffic Control, you can ensure that application traffic always routes to the most optimal servers in your network. Bolster service continuity even further by having traffic automatically routed away from unavailable servers or data centers to active ones. Reduce operational inefficiencies that can adversely affect responsiveness by using a single, integrated tool for DNS, IPAM and global server load balancing. Infoblox DNS the only solution that provides a physical or virtual appliance for use in multiple environments with patented Infoblox GridTM technology that can scale elastically as your capacity needs increase. The technology is flexible and is offered on Amazon Web Services and all hypervisors, such as VMware ESXi, HyperV, KVM and Xen. 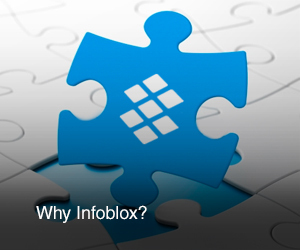 In addition Infoblox is a trusted brand and a clear market leader in the DDI space with 50% market share and growing. Consolidate management via a unified UI for DNS, DHCP, IPAM, DNS Traffic Control, and DNS Security. Ensure continuous service availability even during failovers and upgrades. Easily delegate ownership of DNS zones to different users to optimize team resources. Ensure high availability among multiple DNS servers through Anycast capabilities. Benefits also include higher query performance, redundancy, and load balancing. Gain versatile reporting and alerting capabilities for devices, IP addresses, and other network assets. Rapidly configure new services and reduce configuration overhead. Use customizable workflows to automate a broad range IT processes you currently perform manually.